Click on the above photo to link to the "Torture Accountability Playlist"
Allan Rees of No Lies Radio has called on me, Vic Sadot, to be a reporter at various times sing 2009 when I covered the protests against Berkeley Law Professor John Yoo for writing specious legal briefs to justify the use of torture, and the San Francisco protests against the war on Iraq in March 2009. On August 1, 2018 I covered the "Free Julian Assange" protests at the UK and Ecuadoran Consulates in San Francisco. Bonnie Faulkner Speaking August 18, 2018 against the censorship of her Guns + Butter Radio Show during the "Public Comments" session of the "Town Hall Meeting". NoLiesRadio Report and Truth Troubadour YouTube Playlist "KPFA Censors Guns & Butter Radio". Most recently I was asked to attend the KPFA Local Station Board meetings on August 1 and September 15 to report on the KPFA Management Censorship of Bonnie Faulkner's 17 year weekly program called Guns + Butter Radio. Bonnie Faulkner (2 m 45) “KPFA Censors Guns & Butter” - 5 Video “Truth Troubadour” Playlist Report on the “Public Comments” Session from regular monthly Public Meeting of the KPFA Local Station Board on Aug 18, 2018 in Berkeley, California. Video clip of Bonnie Faulkner Host of Guns and Butter Radio speaking out in Public Comments Town Hall Meeting against Censorship of her 17 year radio show and flushing her archives down the Memory Hole with "no due process" or "community involvement". Subscribe to Guns+ButterBlog! "Security" attempts to stop NoLiesRadio reporter from doing film report! Adding First Amendment Press Rights issue to problems with the elected representatives to the listener problem with Management suppression of show content. I picked Berkeley Calling Blog as the primary site to blog about the Censorship of Guns and Butter because the theme of that blog is the ongoing living tradition and struggle for free speech in the San Francisco Bay Area, and it clearly is a violation of the First Amendment and the spirit of the founders of KPFA, Lewis Hill and poet Richard Moore, who called for strong principles of pacifism and free speech. I post the reports and Truth Troubadour Blog and then they are embedded at NoLiesRadio. BERKELEY CALLING BLOG September 1, 2018 by Vic Sadot: "Censorship of Guns& Butter Radio Show and Press Rights of NoLiesRadio at FreeSpeech Radio KPFA PACIFICA". 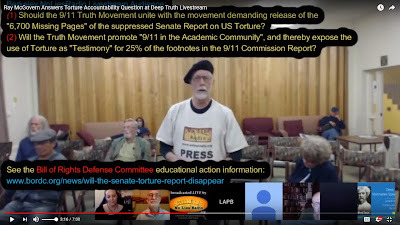 Community Questions KPFA Censorship, Content, and Commitment to Free Speech Radio & Anti-War Truth Journalism – BERKELEY CALLING BLOG 9-21-18 by Vic Sadot announcing a new No Lies Radio Video Report on the KPFA Local Station Board meeting of 9-15-18.
command of the scientific facts about the 9/11 attacks. This was done on a cell-phone in the Berkeley hills, and it fades at the very end. I got a land line later, and the sound was much better when I did an interview with Kevin Barrett​ on MLK Day 2015. Trouble in the Rubble – Truth Troubadour Music Video at Truth Troubadour YouTube from the September 11, 2011 released CD “9/11 Truth & Justice Songs” now available at CD Baby! This is in a Truth Troubadour YouTube Channel Playlist created by Vic Sadot for this CD. This song, Trouble in the Rubble, is a Free mp3 download at SoundCloud by Broadside Balladeer! Two of Vic Sadot's CD's were featured in a segment of the annual "Truth Music Playlist" for Summer 2018 by CorbettReport. The link to the full "Summer 2018" edition that this 3 minute 38 second excerpt comes from is below. Truth Music Playlist – Summer 2018 The Corbett Report. In his annual “Truth Music Report” at 6:55 James features links to 2 of my CD’s at CD Baby and plays a segment of The Ballad of William Rodriguez. At 6 minutes & 55 seonds into the 13 minute, 20 seond presentation James mentions the "9/11 Truth & Justice Songs" CD released by Vic Sadot on 9/11/11 at the 10th Anniversary of that tragic event. He also mentions the "Truth Troubadour" CD from Dec 2016 featuring Eric Golub on violins, violas, and ukuleles. James Corbett plays part of "The Ballad of William Rodriguez". The way that song happened was that Vic was invited to sing at the July 2005 "Truth Emergency Convergence" in Washington, DC. "Mad Cowboy Disease" and "Are You A Citizen Or Are You A Slave" were a couple of Vic's 9/11 Truth themed songs. They were first sung at American University and in Lafayette Square across from the White House. Vic met David Slesinger and David suggested that Vic interview Willie and write a ballad to tell his story. Willie was head janitor of the World Trade Center and jumped into rescue mode after he heard explosions in the basement below him. His fellow WTC worker and friend Felipe was burned in the elevator shaft. Felipe came into the Maintenance office with burned skin hanging from his face and arms and shouting "Explosion! Explosion!" Vic and Willie did the interview over the phone. Vic and Willie met on Sept 11, 2005 in New York City when Vic sang and Willie spoke at the 9/11 Truth rally at UN Plaza and again later at St Mark's Church with Father Frank Morales. "Cheney's in the Bunker" came soon after while reading a David Ray Griffin book, "The 9/11 Commission Report: Omissions & Distortions". Truth Troubadour (2017) – 18 songs sung by Vic Sadot. Featuring Eric Golub, Rob Sadot, Dean A Banks and Rbeast Hunter. 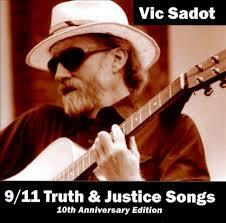 9/11 Truth & Justice Songs (9/11/11) sung by Vic Sadot – Listen free here! Or purchase a song! There's something professional yet friendly and assuring in the James Corbett style and methodology that has won him widespread respect and listenership. He can do the short focused expose with a few wry comedy knock-out punch lines; the long investigative documentary report, such as "A Century of Enslavement: The History of the Federal Reserve; or he can create well-crafter and researched playlists like "9/11 Suspects". 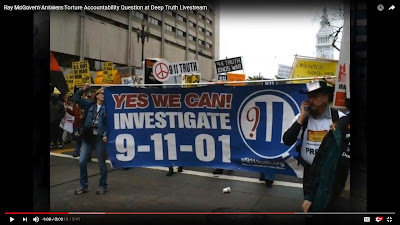 9/11: A Conspiracy Theory 9/11: A Conspiracy Theory (4 min 58) TheCorbettReport Published on Sep 11, 2011. This one has over 3 million views. It slams 9/11 lies to the ground in one tsunami wave of articulate logic and ridicule. lecture about publishing the revised edition of the book “Nuclear Heartland”, which was updated from the original 1988 edition. Johns spoke in Historic Fellowship Hall in Berkeley, CA on October 13, 2016. It was a book celebration event sponsored by the BFUU Social Justice Committee. See PEGMedia for Public Access Cable TV non-profit use of this video! Episode: John M. LaForge 2017 “Nuclear HeartlandUSA” HD (57 m 48) . “Nuclear Heartland” was first published in 1988 to let Americans know where the land-based nuclear weapons silos are located, and that they make you less secure, which is in contradiction of the nuclear deterrence goal. See “Nuclear Heartland, Revised Edition: A guide to the 450 land-based missiles of the United States”. (Paperback) December 1, 2015 by Bonnie Urfer (Afterword), Nukewatch (Author), Jr. Samuel H. Day (Contributor), John M. LaForge (Editor), Arianne S. Peterson (Editor), Matthew Rothschild (Foreword). Cynthia Jean Johnson arranged for the event, which author Cecile Pineda had proposed; Jane Eislie, a long-term supporter of Nukewatch was there. Audio was by Dave Yandle. Post production by Vic Sadot.The video was first published by content creator Vic Sadot to the BFUU Social Justice Committee website, "SOCIAL JUSTICE IN THE HEART OF BERKELEY". It has also been published at other sites, such as Vic Sadot Vimeo and 911TVorg YouTube Channel. It is a Creative Commons Copyright with attribution credits and no edits. This video is available for free download and non-profit use. It has been formatted for Public Access Cable TV non-profit use with full crdits/no edits. PEGMedia for Episode: John M. LaForge 2017 “Nuclear Heartland USA” HD (57 m 48). Truth Troubadour Song for this blog! Ride the Wind (5:33) 9/11 Truth & Justice Songs CD by Vic Sadot on CD Baby’s YouTube Playlist - Lyrics: “Cold winds blow across the land. Dark clouds gather gloom. Children wake up crying! Parents rush into the room! It’s just another nightmare of impending days of doom. But we’re gonna tear Your Terror down! And make the deserts bloom! Yeah, that’s what we assume!” In the post 9/11 world the lyrics take on a new meaning about the phony "War on Terror". nomadiceveryman: KPFA Shuts Down Guns and Butter: This just breaks my heart. Guns and Butter is a great program and has been since 2001. Thank you Vic for the heads up. This Nomadic Everyman Blog at Blogger is the temporary home of American Everyman, which Google censored along with a lot of other blogs on grounds of "community standards". Willy Loman, aka Scott Creighton, also lost his YouTube interface channel called American Everyman, and continues to publish on a back-up channel called ChurchDog42. This is part of a nationwide cross-platform corporate censorship of freedom of speech rights on grounds of private ownership of the platforms and the tiny print statements we all sign without reading known as "Terms of Service" agreements. We wrongly assume that someone in this allegedly Constitutional democratic republic is looking out for the common person. That is a wrong assumption when money is the real ruler of the nation. Yesterday, he published this video about the KPFA management Censorship of a popular 17 year once-a-week radio program called "Guns & Butter" and wiped out all 17 years of programs in the archives! Truth Visionaries Speak Out" NoLiesRadio livestream panel presentations with speakers being in far-flung locations. All sessions are now archived! singer-songwriter, Vic Sadot, asks Ray McGovern questions about "Torture Accountability". "Mockingbird 2.0: Propaganda, Fake News, Fake History, & Outright Censorship"
Panel Participants: Tom Kiely, Moderator. Panelists: Ray, McGovern, Alison Weir, Mark Crispin Miller, and Gerry Docherty. Synopsis/Context/Questions of this Excerpt: (1) 25% of the footnotes in the 9/11 Commission Report derive from Torture used as “Testimony” according to Professor Michael Truscello in the 2013 documentary "9/11 In The Academic Community" by Adnan Zuberi; (2) Obama’s Dec 2016 secrecy classification of the 6,700 pages of the 2014 Senate Intelligence Report on US Torture "green-lighted" Trump to appoint Gina Haspel to head the CIA, a woman who had overseen torture sessions at a black site in Thailand; (3) Ray was roughed up by the Capitol Police at the Senate hearings on Haspel's nomination on May 10, 2018; (4) The 9/11 Truth Movement needs to join the growing movement to win the release of the Torture Report so that it will be used to seek truth and justice via prosecutions and the process of legal discovery. Please make a donation to NoLiesRadio for this monumental effort! Senate Torture Report Disappear? May 2, 2016 by Chip Gibbons. We demand the release of all 6,700 pages of the US Senate Report on the US Use of Torture! Vic Sadot, long-time No Lies Radio volunteer, reporter, event-set/organizer, 9/11 Truth singer-songwriter and poetic music artist with 4 CD's released at CD Baby, which publishes "Artist Collections" on YouTube these days. Tell John Yoo That Torture Is A Crime (5:03) 9/11 Truth & Justice Songs CD by Vic Sadot on CD Baby’s YouTube “Artist Collections” Playlist for this CD Baby CD. Tell John Yoo That Torture Is A Crime – Vic Sadot with the Code Pink Golden Gate Chorus – Truth Troubadour Channel on YouTube! The song was released on 9/11/11 on a CD titled “9/11 Truth & Justice Songs” at CD Baby.